Webhotellit.com Review 2019: Is Webhotellit.com a Good Hosting? Helsinki-based Finnish company Webhotellit provides individuals and small companies with a simple set of web hosting, domain registration, and domain transfer services. Webhotellit was previously known as Neobit (or Neobitti Oy). In 2017, Neobit sold its web hosting and domain business to Planeetta Internet Oy (or Planet Internet, in English), another Finnish company that was established in 2002 and has been offering web hosting and domain solutions since then. Therefore, Webhotellit is a subsidiary of Planeetta Internet Oy, which offers affordable web hosting plans and domain services to individuals and small businesses. Webhotellit’s website can be switched from Finnish into English, but some of the content stays in Finnish. Webhotellit believes in keeping things simple, and therefore offers just three shared web hosting plans to get you started: SMALL, BASIC, and LARGE. While light sites (such as individual/personal sites) can choose the SMALL plan, the BASIC plan should suit the needs of the average small businesses. For larger sites attracting high traffic, you should go LARGE. The Softaculous installer is provided to ease the installation of various apps and CMS software such as WordPress. Some of the hosting plans allow you to pay for additional services such as extra disk space, RapidSSL Certificate (to secure a single domain), and backups. I was surprised to see no obvious indication of uptime on Webhotellit’s website. 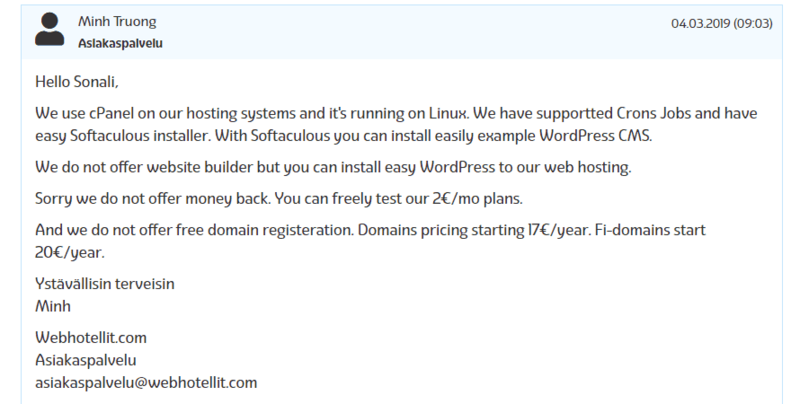 Webhotellit’s web hosting plans are incredibly cheap, even with the 24% VAT added to them. You can pay for plans monthly in euros using PayPal, credit card, online payment, or wire transfer. There is no trial period and no money-back guarantee. Webhotellit’s knowledge base will answer many of your common questions. Tutorials are also available, but unfortunately (for me) the illustrative screenshots within those tutorials remain in Finnish even when the explanatory text is translated into English. Webhotellit’s simple set of super-cheap web hosting plans could be what you need for your personal or small business website; especially if you’re Finnish. Finish your Finnish web hosting search with Webhotellit.com! Wondering how Webhotellit.com stacks up against other Web Hosting companies? Enter any other Web Hosting company and we will give you a side-by-side comparison.